This article appeared in the World Fence News. It describes how the Barbed Wire Dispenser was used on a commercial chain link installation project shortly after it was developed. Completing a 27,000-lineal-foot chain link job in 60 days would be fairly routine for most sizeable fence contractors. Delta Fence and Construction of Escanaba, Michigan agrees, unless the job was located in the snow country of Michigan’s Upper Peninsula and you couldn’t start the job until September, which is the usual onset of the area’s “Arctic style” winter. The project is located at Gogebic/Ironwood County Airport, which is on the Michigan/Wisconsin border, just a few miles from Lake Superior. It involved 27,000 l.f. of 10-ft. high, 9 ga. aluminized chain link with three strands of barbed wire, two automated cantilever gates and several standard double drive gates. As mentioned, this type of project would have been fairly routine, except that the airport’s proximity to Lake Superior means that it bears the full brunt of the “lake effect” blizzards which dump feet (not inches) of snow on the area each winter. Due to the oncoming winter rain and snow which would turn the job site into a quagmire, if the job was not completed by November it would not be possible to bring equipment onto the site until sometime the following August. According to Lancour, “even the airport personnel had reservations about us being able to complete the fence contract before the heavy snows hit. In Ironwood, the snowfall totals can exceed 300 inches per year. “However, we would soon learn that snow would not be our only concern. Rain, rain and more rain, with temperatures ranging from 32 to 40 degrees, many times being accompanied with strong winds, would pose to be another problem,” he said. There would be two things that would prove critical in getting the job completed, Lancour noted. The first was finding proper clothing for the employees, who needed to stay dry while working in cold, wet weather eight to 10 hours each day. He said that at a clothing store in Delta Fence’s home town of Escanaba they were able to find insulated rain gear. Delta Fence paid half of the cost of the clothing for the full time employees. This allowed the crews to work without stopping for any rain out days. The second necessity was the proper equipment. Delta’s widetrack T300 Bobcat proved to be most effective in the low-lying areas when they became saturated with water, he said, while a four-wheel-drive Ford tractor would pull trailer loads of materials where trucks could not go. It could also go through two feet of snow with no problem for framing, stretching, tying, or any other chores. Lancour noted that Delta Fence successfully lobbied the airport to allow the use of aluminized chain link, rather than 2.0 oz. galvanized. The aluminized fabric, which was supplied out of Merchants Metals’ Brighton, Michigan facility, is easier to install, especially when using the Installink chain link dispensing machinery, he said. To increase efficiency, barbed wire and tying were done in one operation. 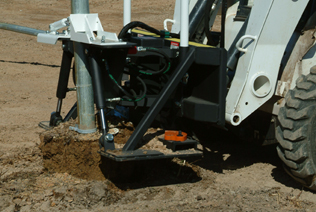 A new barbed wire machine manufactured by L&C Enterprises-USA, Inc. (of which Delta Fence is a division) allowed crews to install three strands of barbed wire along the barb arms tight at the same time, he said. “Our scaffolding along the side of the tractor allowed us to install the barbed wire to the barb arms while we tied and hog ringed the top half of the fence. Stanley Spenax hog rings were used because of their easy installation tool. For tying, Easy Twist Ties, which are also manufactured by L&C Enterprises, were used,” he said. The generator, ties and other supplies were kept on the three-point hitch platform on the back of the tractor. The remainder of the fence was tied as the tractor was driven forward. “The Delta Fence and Construction employees really worked together on this job. They held together when the going got rough. Today we are all stronger because of this,” said Lancour. Besides Lancour and Chouinard, other Delta employees contributing to the project included Bob Schuch, Russ Sargent, Dave Ellison and Brad Christian. Weekend college worker included Tim Dahlman, Dan Maloney, Greg Elliot, Joel Valley, and Adam Bonsall. An interesting sideline regarding Delta Fence and Construction is that it came about because of the activities of L&C Enterprises-USA, Inc. According to Chouinard, L&C Enterprises- USA, Inc. produces the Installink. This product was developed by the two owners when they were working on a highway job for a different road construction company. The company turned into a “test bed” for the Intallink, whereby Lancour and Chouinard identified on-thejob needs and made improvements to the equipment. The needs of their own installation company were also the inspiration for the development of other types of equipment which they now offer. As the years passed, accounting issues made it simpler for Delta Fence and L&C Enterprises-USA, Inc. to become one company. USA, Inc. d/b/a Delta Fence and Construction. “We still find ourselves with a need to develop new equipment, and because we have the capability of installing large jobs, we test the equipment for a period of time, usually a couple years. Then L&C Enterprises-USA, Inc. will bring the products to market,” he said.